Fresnillo has been in production since 1554 and is the world’s largest silver mine, with production plus resources totaling more than 3.2 billion ounces of silver (Megaw, 2010)! Surprisingly, only 250 million ounces were produced prior to 1976, when the fabulously rich Santo Nino veins were found. These veins ran over 150 ounces per ton, with the silver dominantly present as the “ruby silver” mineral pyrargyrite. A rock pick dragged across the surface of the vein left a streak that looked like a bleeding wound. 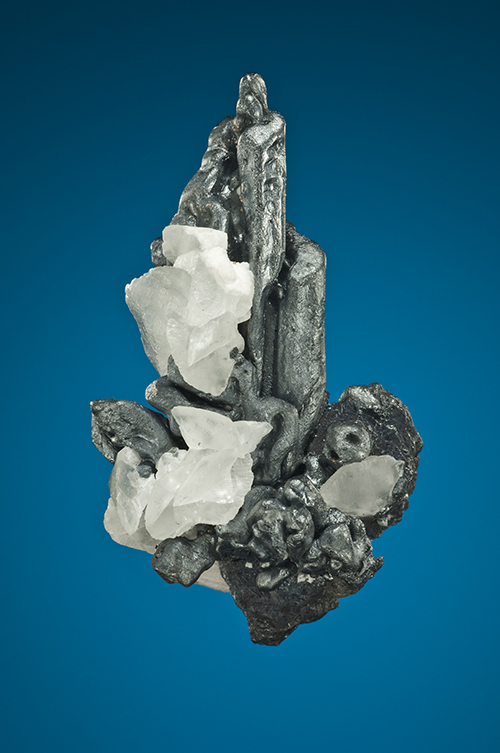 Fortunately for collectors, the veins had abundant quartz-lined vugs studded with pyrargyrite crystals to 8 cm long. These vugs ranged from a few centimeters across to walk-in pockets several meters wide and long. So specimen numbers were high, but silver was the mine’s lifeblood, so the company took a dim view of ore leaving the mine by any other route than through the mill. Getting caught with specimens was a firing offense, but miners are a crafty breed and somehow a steady stream of superb pieces managed to find their way into the hands of the local mineral dealers. Starting in 1997, a new series of veins were found in the western part of the district. Equally rich, but dominated by acanthite, these veins were wider than Santo Nino and became the backbone of the district’s burgeoning silver production. Over this time, the mines were mechanized, so human contact with the veins is now very limited. Nonetheless, small numbers of exquisite acanthite crystals to 12 cm across showing concentric skeletal growth have escaped the crushers and made it to the specimen market. There is every reason to think the Fresnillo district will continue to grow and prosper and yield the occasional important specimens. We just have to avoid thinking about how many are blasted to bits without anyone ever seeing them.